PPHC points will be tallied beginning with the date the PPHC membership is PAID IN FULL to the club/show secretary or club treasurer. YEAR-END HIGH POINT AND RESERVE CLASS AWARDS – The one horse/one exhibitor rule applies except for Open classes. Each horse must be shown in at least 5 of the 7 PPHC shows throughout the year. YEAR –END HIGH POINT AND RESERVE DIVISION AWARDS – The one horse/one exhibitor rule applies except for Open classes. Each horse must show in at least 5 of the 7 PPHC shows throughout the year. Each horse must show in at least 3 or more performance classes. OPEN – Class and Division Awards – Owner of horse MUST be a member of PPHC. Exhibitor must be an APHA member but does not have to be a member of PPHC. HALTER – Year-end high point halter winners will receive 4 additional points for High Points and 2 for Reserve High Points for the year. NOVICE AMATEUR/AMATEUR – Class and Division Awards – Both owner and exhibitor of horse MUST be a member of PPHC. One Horse/one exhibitor rule applies (see APHA rule AM-020). NOVICE YOUTH/YOUTH 18 & UNDER – Class and Division Awards – Both owner and exhibitor of horse must be a member of PPHC. One horse/one exhibitor rule applies (see APHA rule YP-015). WALK TROT 5-10 – Class and Division Awards – Both owner and exhibitor of horse must be a member of PPHC. One horse/one exhibitor rule applies. APHA ownership rules apply (see APHA rule YP-110C). Exhibitors may compete in only one showmanship class, walk trot or 18 and under, but not both. An exhibitor may not show in both lead line and walk trot riding classes (see APHA rules YP-110B.1. and B.2.). 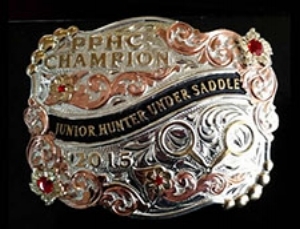 LEAD LINE 8 & UNDER – Class Awards – Both owner and exhibitor of horse must be a member of PPHC. One horse/one exhibitor rule applies. APHA ownership rules apply (see APHA rule YP-105D). ownership rules apply (see APHA rule YP-105D). AMATEUR WALK/TROT -Class and Division awards. Both owner and exhibitor of the horse must be a member of PPHC. One Horse/One exhibitor rule applies. APHA ownership rules apply.